Some images just stick with you. This one's got me. When I was just turning four my family moved to a house on the shore of Lake Ontario, some miles outside of Rochester, NY. There were few other houses around and not too many other kids to play with so much of the time we made our own fun. One of my clearest memories were the huge fires my sister and I would make from the driftwood we'd collect along the rock covered shore. With no other lights visible, the night sky was pure ink black. Part pyromaniac, I used to love to make the biggest fires possible. Like the one in Rockwell Kent's engraving Flame above, the fires would spit out sparks that would be carried upwards by the heat to disappear among the stars. Looking at Kent's reclining man, I know Kent loved following those upward paths of his fires' sparks too. Fire of course when you watch it flicker and burn seems to have a living quality. 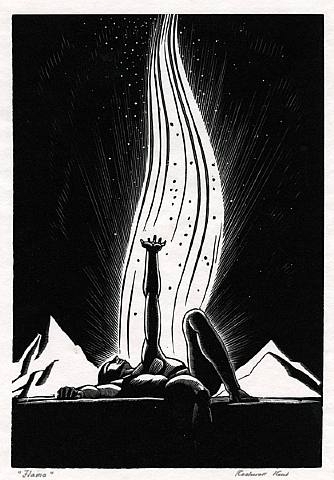 And in the hands of Rockwell Kent it becomes an amazingly believable symbol of life itself, of all our energies and our loftiest striving. Pulling that off was a tall order. A lot of thought went into inventing the pose. While what first catches our eye is the man's up-reaching arm, his raised and bent knee is also important. Kent is trying to subtly mimic the feeling of the mountains in the figure. The raised knee evokes the pyramidal feeling of the distant peaks. Look at how the shin on the upraised leg is exactly the same length as the diagonal sides of the mountains. Kent doesn't over do this, letting the pose seem unforced and natural, but at the same time he sets up a little dance between the figure and the enormous snow-clad topography behind. It's Kent's way of saying what ever he's going to show you is grand and important. I spoke in the last blog post about how Kent seemed most inventive when confronted with the severe limitations of wood engraving- white and against black with almost no chance to go from sharp to soft edges or show us gradations of his tones. Somehow having fewer of these tools at hand brought out in him a deeper level of seeing, allowing him to milk every last drop of expressiveness out of a well chosen shape. The perfect example is the relationship of the arrow-straight gesture of the man's arm reaching to the heavens contrasting the sinuous curving silhouette of the flame. Kent plays up the contrast of the arm against the carefully sculpted curves. There's alway a danger of being too predictable with where one places one's shapes. So often lesser artists make things too symmetrical. Instead Kent injects little surprise of asymmetry into his design. See how the man's arm is just a bit to the left of the center of the flame. Or even more subtle, how the thin white rays shooting off the left side of the flame are more vertical than the ones coming off the right side. It's little touches like this that unconsciously pull you in by provoking your curiosity. P.S. George Billis Gallery in New York reopens its 2nd solo show of my own landscape paintings on Wednesday, Jan. 2 after their holiday break. The show runs through Jan. 19, 2013.